Macclesfield Roofing are specialists in slate roofing. Slate is renowned for its natural, hard wearing and waterproof properties which last for years and years. As a traditional building material, slate is known for its tough durability which lasts for the lifetime of a building. Resistant to acids, alkaline and other chemicals, slate can withold extreme temperatures, hot or cold, as well as stabilising a building’s structure. Macclesfield Roofers are time-served tradesmen and we can offer our customers the choice of new or reclaimed slate. Slate has unique characteristics which adds to the aesthetics of a property- giving a natural and attractive appearance to the building. There are several varieties of slate, each with its own character and colour. 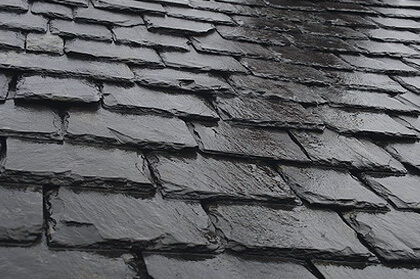 Macclesfield Roofing has years of experience in the supplying and installation of slate tiles. If you’re interested in having a slate roof then we can source the right tiles to suit your area and your home. Our reclaimed slate comes from older buildings where the slate has been removed due to the roof’s foundations failing. If you have an existing slate roof that requires repair due to due to storm damage or simply a roof that needs general maintenance, then Macclesfield Roofing can handle any requests! Our experience of working with slate means that you can be sure of the quality of our work. Alternatively, if it is a tiled roof that you have, contact us today for a free, no obligation quote on 01625 427 581.